I am in the foyer of the much loved Polka Children’s Theatre setting up The Prediction Machine and weather station for their Techtopia festival which is opening on Thursday 24th May. It is another heatwave continuing a wave of strange weather in the UK so far this year. The weather station is on a pole attached to the fence in the garden tracking the day as it heats up. It is 11.14am and is saying 24 degrees celsius outside in the garden. The temperature gauge may be too much in direct sunlight so the readings are possibly a bit high – the weather report is more like 21 degrees celsius, it’s hard to keep the temperature away from the sunlight but also have the wind and rain away from shelter in this spot – I will keep tweaking it over the next couple of days before the festival opening. I am also preparing for a workshop with two local school groups. We will be building a ‘Future Machine’ using electronic devices, a weather station and by thinking about weather, climate, the environment and what kind of future we would like to live in. The machines are due to arrive at 1pm so we will get them set up this afternoon! 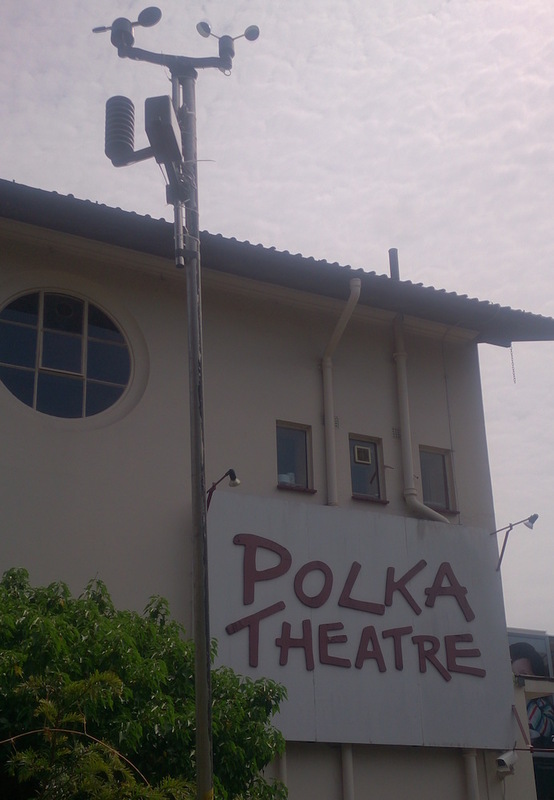 Look here to see what the live weather station is at Polka Theatre!